See here to get to know me better. Hi, I'm HappyLee, a (college student) from China. I don't play video games much, mostly just Super Mario Bros for TASing. Music and computer are my 2 favorite hobbies, and I like to compose sometimes. I joined TASVideos in 2007, and then I submitted my first movie in 2008. TASVideos is the best place players can get, and I enjoyed a lot here. I have 6 movies and 30 submissions here till now. This is an 1-frame improvement to one of the most unbeatable movies on our site. The route I've selected is perfect in both speed and entertainment, at least in my opinions. The improvement comes from the fish scene in 8-4, it was the faster-turning strategy that saved me 1 frame. 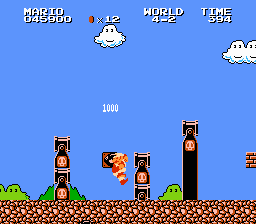 That's one small frame for a level, one giant improvement for SMB history. Feel free to watch the comparison video. This movie is a full warpless run-through, it's one of the movies that I am most proud of. Mario found entering castles every time slow and boring, so he dredged more secret underground paths more quickly to princess's freedom. The improvements came from 2-3 (83 frames), 7-1 (42 frames), 7-3 (83 frames), and 8-4 (1 frame). For more information, it is encouraged that you read the my comments. This is the real Super Mario Bros 2. It was never officially released in the USA or Europe for the NES. It was later ported to the SNES, and released as "Lost Levels" in Super Mario All-stars. Here's a self-explanatory comparison video that I made: Download 2048x1152 HD comparison encode (MKV, 35.3 MB). This movie is 85 frames faster than the previous one due to the use of a "cheap trick". Here we are presenting the finally finished improvement of 110 frames (1.83 seconds) over the previous SMB2J Luigi run. This run uses a suboptimal character, Luigi, who seems to have larger inertia than Mario (possibly because he's heavier), that appears higher jumping but slower accelerated speed. In some degree, those did bring lots of difficulties to this run, but we tried our best to take advantage from those abilities, and to make the best of Luigi. While aiming for the perfect speed, we also tried VERY HARD to make every level as entertaining as possible. Wherever there are two paths with almost equal entertainment, we would deliberately choose a different path than Mario, and looks like we've done a successful job making a distinctive Luigi run differs from the Mario run. This movie underwent a very intense frame war. In the end, I was the victor with this 4 second improvement over the previous movie. 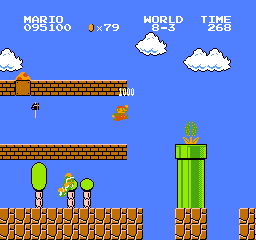 Extra Mario Bros is a hack of the original Super Mario Bros. It is noteworthy for being a complete "Metroidvania" game built around the original SMB engine, with very few changes to the engine itself. The five areas in the game are all interconnected (via pipes, naturally), and permanent upgrades have been added to make a more Metroid-ish feel. However, despite his newfound ability to return to levels he's visited before and acquire upgrades that don't go away when he dies, Mario still cannot move to the left. This movie collects all of the keys and fights the true final boss, but only collects two of the upgrades. Here are some TAS projects that I care the most, I'd like to watch these wonderful movies in my free time, and I'm sure you'll like them, too. 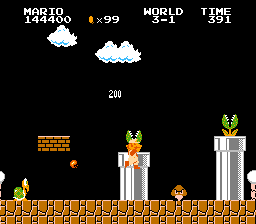 There's always something you don't know about Super Mario Bros. For more tricks, please visit Super Mario Bros. Tricks page and SMB Technique_List of Mana. This is a kind of a special state in "Left+Right mode". It happens sometimes when you slow down the speed on the ground with "Left+Right mode". It looks like walking without moving, in fact, the X-speed goes "1, 255, 1, 255..."and it will never stop, so the X-subpixel goes "x, x-16 ,x, x-16...". When "x"=0, "x-16" turns to be 240, X-pixel has changed, Mario is shaking and the screen begin to scroll. That makes the "moonwalk" acton useful. Koopa Troopas can be useful in the end, just like Bullet Bills. 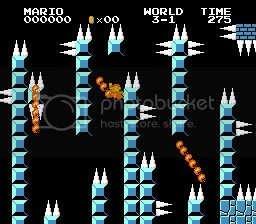 You have to go into the block at the pole first, with the perfect bouncing height, you may be able to finish the level without going to the castle. Stamping on shells bounce higher than stamping on Bullet Bills, so we can't complete this action without going through the block first. It was found by klmz. Complete the level without lowering the flag by glitching into the base block of the flagpole and touch the flapole from inside. The points got from the flagpole will be only 100. With this glitch, we could save about 21 frames in most of the levels. The reason why I didn't use flagpole glitch in 8-3, is because if you do the glitch the timer ends on a 3 and you get 3 fireworks. It was found by Mana? Pressing L+R on a vine at the right time can send mario to the right side of the screen instantly sometimes. This was the first TAS movie showed the vine glitch. It was found by HappyLee? You may find it shocking when you hear that one fireball can harm Bowser 2 times. It's way too accidental but it's true. 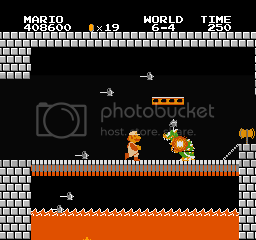 Due to most of the enemies in SMB can only be harmed once by fireballs, this special glitch can only be used in Bowser fights. Here's a demonstration of killing Bowser with 3 fireballs in 1-4 by me. I believe the reason is probably that Bowser is a connection of more than 2 parts. When the fireball reaches the seam between 2 parts, it counts as 2 hits. This glitch may be very useful in TASes. Unfortunately, I haven't found a good way to calculate to make this happen, so during the time we could only manipulate luck real hard to get that done. Mario: Haha, you can't hurt me now! 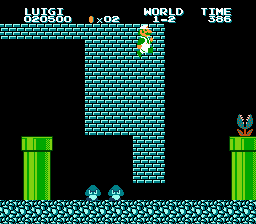 A FireBar can't always hurt Mario, you can see there are gaps between each 2 states it turns if you look carefully. It is used in some special hacks, such as toy09_FireBar of Mana. "Here's some other websites that I'd like to visit" Did you perhaps mean "Here's some other websites that I like to visit" or "Here's some other websites that I'd like you to visit" ? HappyLee: I've fixed that one, thanks, Nach. Now building... If you have any suggestions, please talk to me on IRC, thank you for visiting here. This page appears to be the personal page of HappyLee.